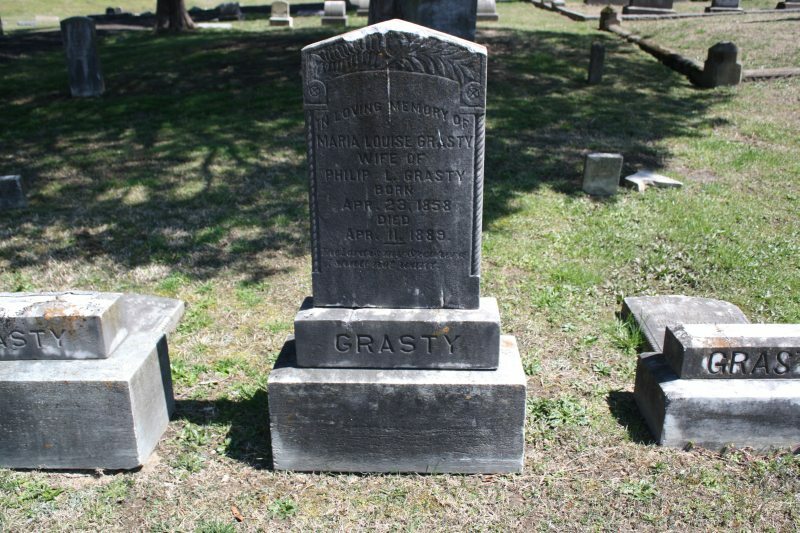 From page 109 in Green Hill Cemetery’s Mortuary Reports, Dr. Franklin George declared 30-year-old Maria Louise Grasty’s cause of death as “unknown.” The doctor had seen her for some reason on the 8th and according to the ledger, she passed away on April 10. The tombstone reads that she died on April 11, but the discrepancy could be based on the notion that she’d died in the later hours of April 10 or the early hours of April 11. A little more information about Maria’s death was found in an Alexandria newspaper. Printed within a day or two of her death, it was reported that her body was found kneeling by the bed. Due to the discovery of an empty chloral container in the house, the speculation was that Maria had accidentally overdosed trying to medicate herself to sleep. The article also mentions that Maria and her husband, grocer Philip Lightfoot Grasty, were separated. They were together at the time of the 1880 census, so sometime between then and 1889 the marriage had ended, although they were probably not legally divorced because of the inscription on her tombstone and the fact that she’s buried in the Grasty square beside Philip. It would be interesting to know what Maria’s emotional state was at the time of her overdose. We can only infer from the tiny blurb in the newspaper that she was alone and having difficulty sleeping. Details about Maria’s life were relatively scarce. I couldn’t find her maiden name, but she was born in South Carolina. According to one source, she was a teacher at the Loyal Street school in 1879, living with Philip on Wilson Street. In the 1880 census; however, her occupation is “keeping house” and the couple is reported as living on Colquohoun Street. Chloral hydrate is a central nervous system depressant that was used regularly in the late 1800s by insomniacs. Mixed with alcohol, this hypnotic and sedative drug created “knockout drops” or a “Mickey,” a potentially lethal combination known to render people unconscious. Chloral hydrate was addictive and often abused in Maria Grasty’s day, carrying unpleasant withdrawal symptoms: hallucinations, sweating, seizures and shivering. An overdose could kill a person in as little as five hours. If Maria died from an overdose of chloral hydrate, she could’ve experienced any of the following: a racing heartbeat, hypothermia, difficulty breathing (possibly leading to respitory failure), low blood pressure (or high blood pressure), pupil constriction, and areflexia (the lack of reflex responses). Before death she may have lapsed into a coma. Since she was kneeling beside her bed, Maria may have been trying to get out of bed or into it, depending on which way she was facing. If she knew that something was amiss, her last moments alive were probably terrifying. Remember, this was a woman most likely living alone in a day and age where there were no telephones or 911 system to summon for help. Reflecting on Maria’s final chapter (or what I know it to be at this time), a heartbreaking scene unfolds: a young woman estranged from her partner, self-medicating in search of rest, dying alone in her bedroom.